The classroom was silent by design. Students meditated as part of a life skills class, the quiet punctured only by the occasional sneeze or cough. Something about the moment struck Joshua Kelley in the way most moments do. He burst out laughing, drawing more than a few quizzical looks. Yes, there was. 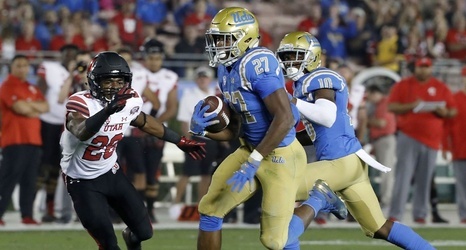 Comedy is central whenever the relentlessly positive UCLA tailback is around. He’s always smiling or giggling, no matter the circumstance. “He’s by far the happiest person I’ve ever met and the nicest person,” punter Stefan Flintoft said. “Like, I’ve never seen him without a smile on his face.